Hi! Welcome to Project House to Home. It feels so good to be blogging again! Where to begin? Well, a lot has changed this year. I left off over at Home with Baxter letting you know that I sold my house last December. I moved to an apartment with the dogs for 7 months, and to be honest, lacked any motivation to decorate or work on any projects. I did do a slew of custom mood board projects, but with my new financial planning job it was hard to keep up. I made the decision to stop my design services and am no longer accepting clients. This was a difficult decision for me because I really enjoy the work, but I really believe in finding work/life balance and at the end of the day, there's only so much time. But on to the exciting news! I bought a new house in Maine with my boyfriend, Matt, and we have plenty of projects to tackle. The house is a 1940s Cape Cod style home with lots of charm, but it needs some work. I am SUPER excited to have projects again! We've had such a beautiful summer that we've been spending a lot of time outdoors trying to enjoy it while it lasts, so progress on the house has been slow. I've taken away some lessons from remodeling my first house, one being that I will finish projects before starting new ones. The first project we're working on is our living room. 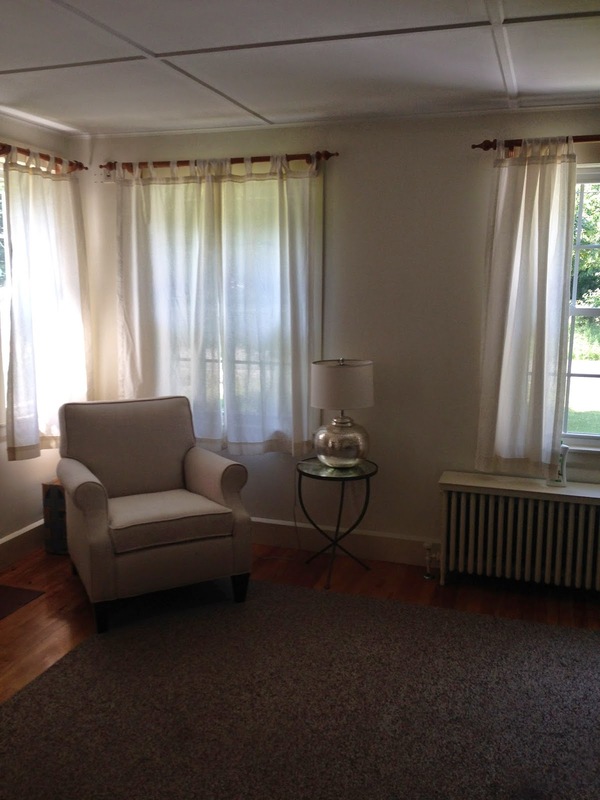 The changes are cosmetic (paint, window treatments, and new furniture). Here's a look at the room before we started any work. The ceiling and fireplace have great detail. The plan is to paint the fireplace surround and all trim bright white (almost done!) and paint the brick a gray color. We may tile the hearth. 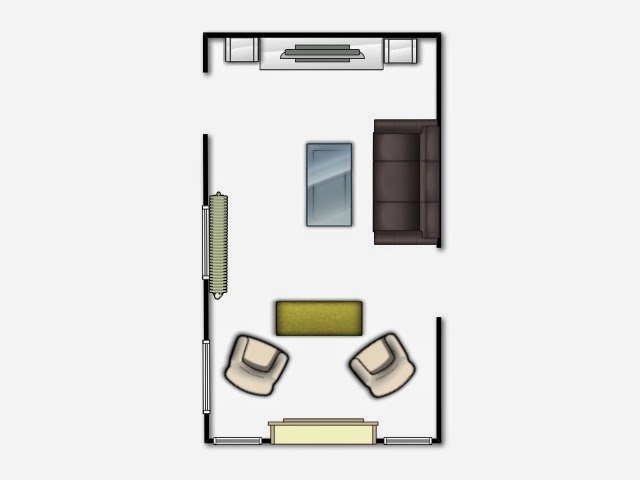 The floor plan is pretty challenging considering this is our only true "tv watching" room. 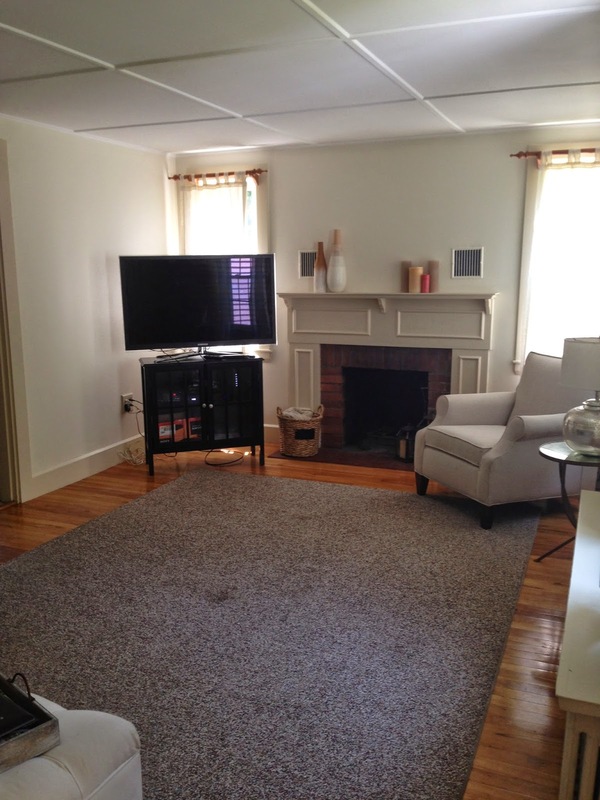 Originally we wanted to mount the television above the fireplace but we found out we can't do that. Our fireplace has a heatilator which means it blows out and circulates air. You may notice that there are two vents above the fireplace and we're told we can't cover them. Since we want to use our fireplace in the winters, we had to come up with another solution. I really like the two windows that flank the fireplace so the current tv location I really dislike. The plan is to move the tv to the wall opposite the fireplace (the wall that our sectional is currently residing on in the photo below). This will mean we have two focal points, which most designers would tell you is a no-no, but hey, sometimes you have to break the rules! 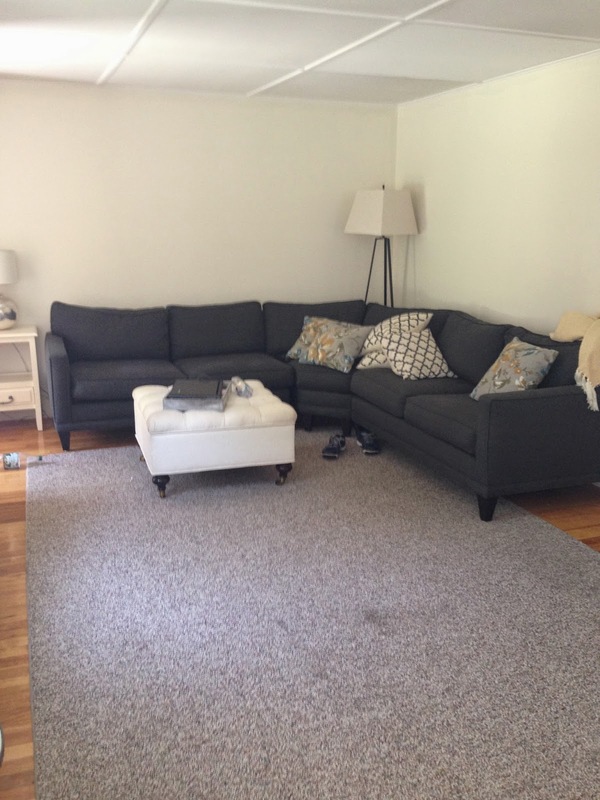 My sister is taking the sectional and I ordered a smaller sofa instead. I plan to use Ikea shelving to create a media wall for the TV. The first floor of our home has the old radiators. I found a company that makes custom radiator covers that really look like beautiful furniture, but are still functional. I'm hanging simple bamboo shades in place of the curtains. I also orderd a new coffee table to replace the ottoman and new area rug. 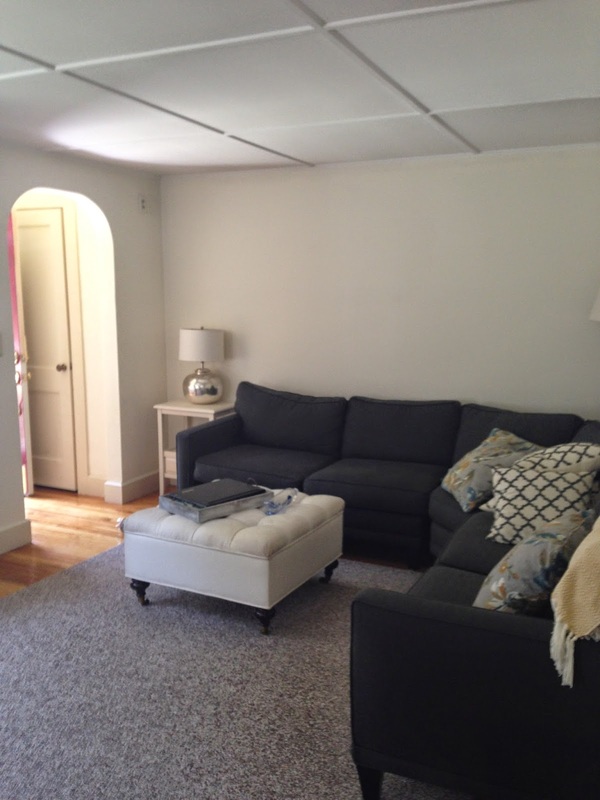 I'll post next time with some more information on furniture sources and which paint color I chose for the walls. Can I make a suggestion? Why not make two seating areas? Face the couch so it's properly head on, maybe with a hall table behind it if there is room. Then turn the two chairs to face the fireplace so that you can enjoy a good book and a roaring fire in the winter. Not sure if you have the space, but the floor plan looks like it might be possible. Hi! Thanks for the suggestion. I did consider that, but I don't think there's enough room to have the couch face the tv and allow good traffic flow. The room is long and narrow with odd opening and window placements. I played around with many different floor plans. I'm not committed to the one above and I think I will have a few different options with the furniture selections I made. You'll just have to come visit and let me know what you think! All the way from the Netherlands, congrats on this new home and the guts to make the decision to stop designing, for a living at least. More time for designing this new place now I hope! Your lesson not to start a new project is one hard learned for me as well since I have bought a house november last year and somehow imagined I could do changes in all rooms all at once.... ^^. That strategy backfired so I am currently dividing the house in sections and tackling one by one and resist the frustration that some will have to wait a while. Love to see the progress, have fun! Hi Suzanne! Thanks for reading all the way in the Netherlands! Yes, I made the same mistake of trying to tackle too many projects at once and you just end up with an unsettled, unfinished mess of a home. I'm *trying* to not take on too much at once but it's hard because I have a vision for each room, but it will take a while before I can make it a reality!